So you don’t like the default fonts on your Android? Or you have seen a custom font on your friend device! Well the default Android font, Roboto is not bad, I mean the overall look and size is pretty good but still you’re looking for more fonts. Don’t worry you can still install plenty of new fonts on your device without having root access. We all know unlike other smartphones OS, Android gives you the ability to customize the complete UI using different apps and launchers. Installing a custom font is very easy when you’ve the font .ttf file. This post list the 85 best fonts you can download and install on your device. I will also reveal font apps for Android that makes it a lot easier to install font of your choice. Later, you’ll also find apps that requires root permission but don’t worry if you have have rooted device. By default you can change font or font size from Settings > Display > Font Style. The most common Android device manufacturers including Samsung, HTC, LG and others have added this feature by default. Using the settings you can easily choose a different font style as well as font size. Default font includes a number of good stylish fonts that can add different look and flavor taste to your phone UI. Depending on your device you may have different options for changing font but primary option remains the same which is mostly like to found under the Settings > Display or sometimes under Accessibility. I am using a Samsung Galaxy device and luckily they have added a few extra fonts. You’ll also get an option called, “Get fonts online” by tapping this option, Google Play opens where you can download other fonts. Earlier, I mentioned you can install any font using the Android launcher apps. Go launcher, one of the best launcher available on the play store can help you to get your favorite font on the device. Copy .ttf font files to phone memory. Open Google Play and install GO launcher if you haven’t already. Select the Tools and tap on the Preferences icon. Scroll down to Personalization and browse it. Tap Select Font and tap on the font that you want to use. You can get additional fonts by installing another app GO Launcher Fonts from here. It will give extra 57 fonts that you can install without any issue. 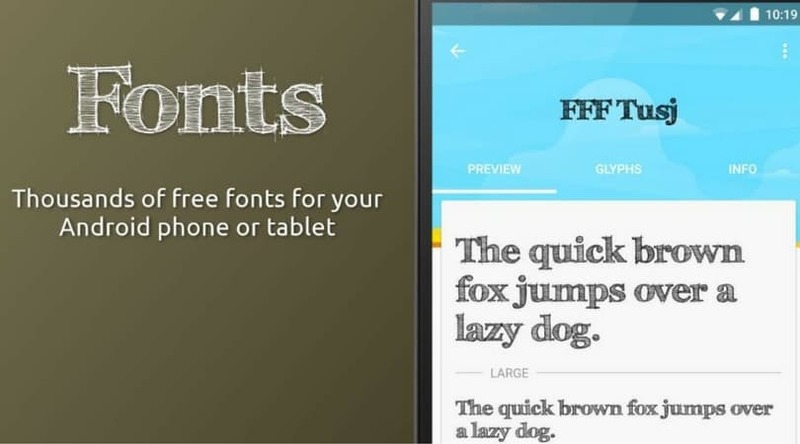 Download and install iFont from Play store. Tap on a font name that you want to install and hit download. Tap the set button to apply that font to system. You can also go to Settings > Display > Font Style and look for the font name you’ve recently installed. That’s it! This is how you can change or install a new font on the device. If you’ve rooted your Android and looking for a best app that can install free fonts on Android then no look further other than FontFix. It is a free app that supports over 4,300 fonts. You can download FontFix from Play Store using this link. Finally, I hope you enjoyed the post and learn how you can install and change font on Android. If you find it useful, don’t forget to share it.